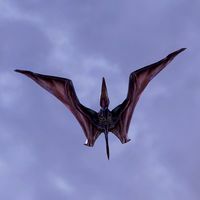 Cliff Racers are passive creatures that can occasionally be seen flying in circles in the skies above Stonefalls and Vvardenfell. [verification needed — Can they be found in Bal Foyen and Deshaan?] They cannot be harmed in any way, and can be heard screeching as they fly above. Their relatives are the Cliff Strider, Cliff Darters, and Bantam Guars. The Dive skill for the Warden class summons a Cliff Racer, but the model is a blue Cliff Strider. They first appeared in TES III: Morrowind, but rather as hostile enemies. This is subtlety explained by some pet descriptions, where Thetys Ramarys of Balmora says "I love our Bitter Coast Striders, but feel bad that they can't fly very well. So I'm selectively breeding them into a strain that, one day, will dominate the Vvardenfell skies, pursuing its prey for great distances!" This means that the Third Era cliff racers are a mix of racers and striders, explaining why they had become very ferocious in the future. This page was last modified on 23 February 2019, at 18:28.